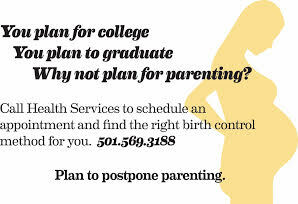 UA Little Rock Health Services provides family planning services, female annual exams, and examinations for any gynecological or breast health concerns. Our healthcare providers offer non-judgmental care in a safe environment, where every patient is treated with respect and dignity. All services are private and confidential. Family Planning: Nationally, about 70 percent of college students report being sexually active. The majority of these students are in heterosexual relationships and therefore are capable of becoming pregnant, whether or not they desire it. Make an appointment today with one of our providers to discuss family planning and to select a birth control method that is suitable to your health, lifestyle, and relationship. Female Annual Exams: These exams include an assessment of general health as well as sexual health; they include a breast exam and may or may not include a pelvic exam and a Pap smear – a laboratory screening for cervical cancer. We follow the latest American Congress of Obstetricians and Gynecologists (ACOG) guidelines for PAP screening. Screening for sexually transmitted infections also can be done during these visits. Family Planning and birth control methods may be addressed.